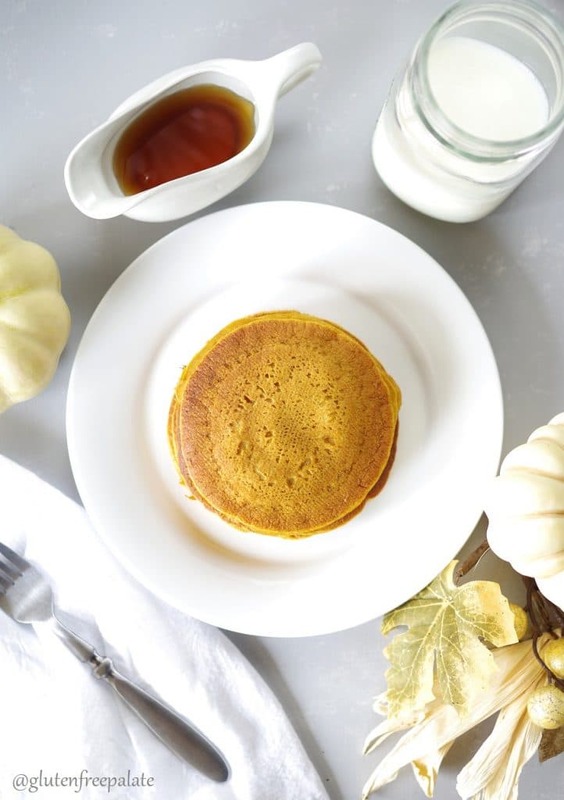 Delicious, quick, and easy – these Gluten-Free Pumpkin Pancakes make a tasty and nutritious breakfast that will start anyone’s morning off right. I love pancakes. They are such a simple yet filling breakfast options. 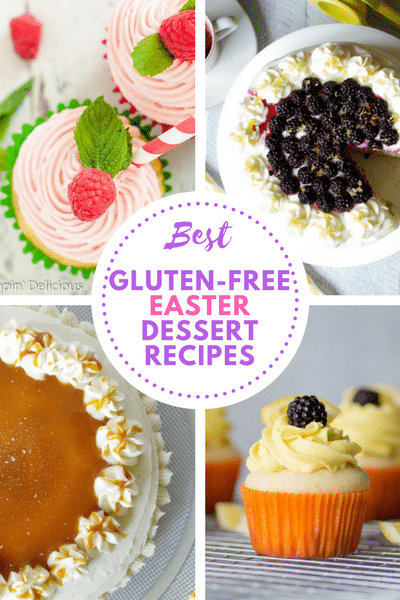 You can top them with anything from fruit or syrup, to nut butters and honey. I feel like the options are limitless. Pancakes can be made with just about any fruit or spice. 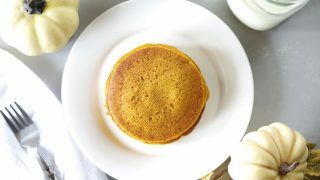 Good old fashioned buttermilk pancakes will always be my favorite, but this summer I’ve been craving pumpkin pancakes. If you are looking for traditional pancakes, you can skip over to my gluten-free pancake mix recipe. Otherwise, keep reading, you don’t want to miss out on these scrumptious gluten-free pumpkin pancakes. I keep checking the calendar to see if it’s fall yet. They I realized, pumpkin doesn’t have to be a seasonal ingredient. You can use pumpkin to make many wonderful dishes all year long. I do limit my pumpkin pie consumption to winter. But during the spring and summer months, I like to enjoy pumpkin pancakes, pumpkin cheesecake (in my cookbook), and homemade pumpkin spice lattes. Pumpkin has many health benefits; it is packed with vitamin A, fiber, and the antioxidant beta-carotene. I don’t necessarily eat pumpkin goodies for the healthy benefits though. I think pumpkin treats are out of this world good and I will rarely pass up the opportunity to enjoy something made with pumpkin. These pumpkin pancakes can be whipped up in no time. They have just the right amount of pumpkin and spice to provide the perfect balance of sweetness and flavor. Serve them hot with maple syrup, or enjoy them plain. 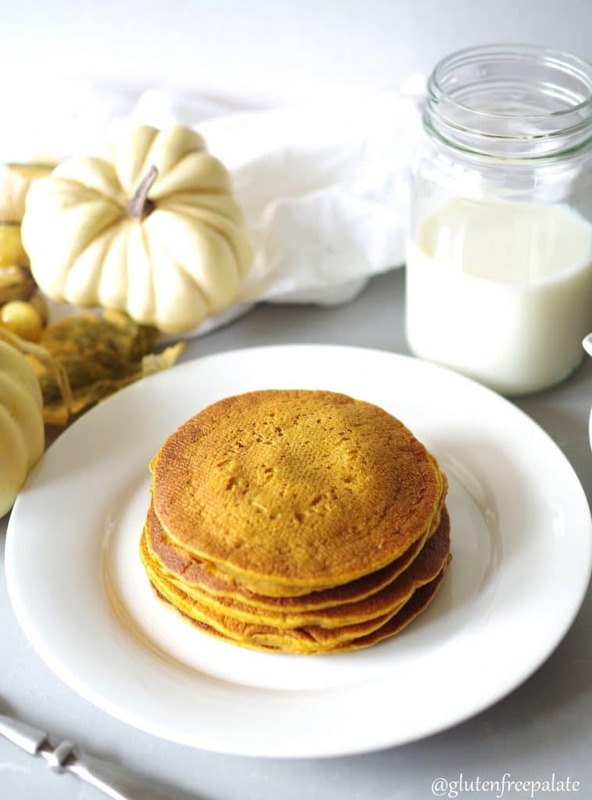 Can I make these gluten-free pumpkin pancakes dairy-free? Yes. 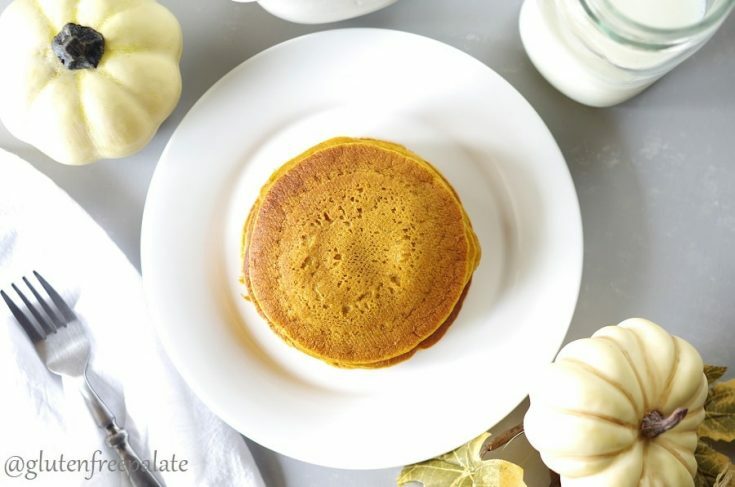 You can use your milk or dairy-free milk of choice in this gluten-free pumpkin pancake recipe. What other flours can I use? If you don’t want to use my flour blend, you can also use Bob’s Red Mill 1-to-1 Gluten-Free Flour Blend (affiliate link) in this recipe. I haven’t tested any other blends but most blends with rice, tapioca, and potato starch should work. Looking for more pumpkin recipes? You might like my Gluten-Free Pumpkin Spice Cornbread, Gluten-Free Pumpkin Bars, or my Gluten-Free Pumpkin Bread. 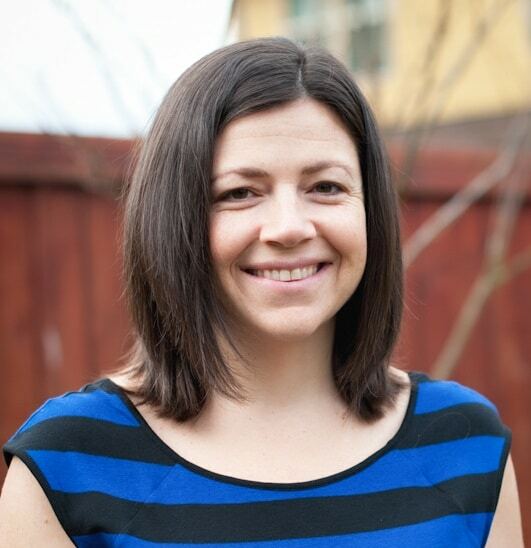 Carolyn at All Day I Dream About Food has an amazing recipe for Low Carb Pumpkin Pancakes if you need a low carb option. If you want to take these pumpkin pancakes up another notch, might I suggest you stir a 1/2 cup gluten-free chocolate chips (affiliate link) into the batter before cooking them? 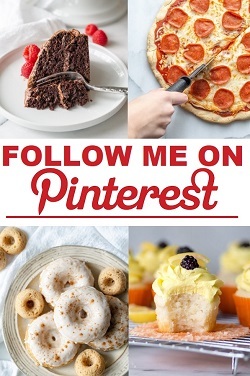 Stop back by and let me know what you thought of this recipe. Also, if you have any questions please leave me a comment and I will gladly get back to you. In a large mixing bowl, whisk together milk, pumpkin, egg, oil, and vanilla. In a medium mixing bowl, combine the flour, brown sugar, baking powder, baking soda, pumpkin pie spice and salt. Stir dry ingredients into the pumpkin mixture until just combined. Heat a lightly oiled griddle or nonstick frying pan over medium high heat. Pour or scoop the batter onto the griddle, using approximately 1/4 cup for each pancake. Cook until surface of pancakes start to bubble, about 1 to 2 minutes. Flip and continue to cook until done. For this recipe, you can use my all-purpose gluten-free rice flour blend. Rather than making a whole batch, you can scale it down to 1 cup white rice flour + 1/2 cup tapioca flour + 1/2 cup potato starch. This recipe didn’t work for me. The batter was the consistency for muffins, not pancakes. I triple checked the measurements and it was all done according to the recipe. I kept adding milk to thin it enough to spread out on the griddle, but they took so long to cook on the inside the outside was over cooked. I never ate one of them. Too bad, because it looked like a tasty recipe. I’m sorry to hear that your pancakes didn’t turn out. Can you help me understand how you measured the flour? I just made this recipe this week, and have several times, and it’s a great recipe. I’d like to help you figure out what happened. Thank you Karin! So glad you liked them.